O’Donohues Bakery is about to embark on a new journey for their organisation with the launch of a new UNIQUE product to the foodservice industry. The products are called ‘Penny Loaves’ and they are fully baked, soda based breads that are shaped like a mini loaf and frozen. Essentially they are an alternative/replacement to the traditional soup roll. The advantage with this product is that it is fully baked as opposed to part baked meaning it can be defrosted at room temperature and ready to serve. This is also the main difference over the competition which gives us the opportunity to gain a large chunk of the market share. The idea for the ‘Penny Loaves’ was born over two years ago at an international trade fair in Croke Park after receiving feedback from buyers in the foodservice industry that they loved our products but wanted to see them frozen. 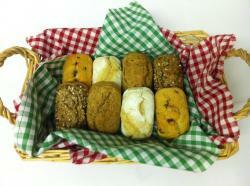 Two years and much research and development later O’Donohues is now in a position to launch the Penny Loaves…almost. This diversification does require investment and O’Donohues Bakery are partnering with Linked Finance to help raise the required funds to launch the ‘Penny Loaves’. LinkedFinance is a company which offers trustworthy small businesses a new viable alternative to borrowing from the banks. Real people like YOU can lend small amounts to companies like O’Donohues Bakery at very attractive interest rates (much more attractive than if you were to leave it earning interest in a savings account!) Greedy bankers get bypassed, the wheels keep turning and everyone wins. You can follow this link https://www.linkedfinance.com/business-loans/finance/borrower/loan?id=686 and become a lender yourself, remember it doesn’t need to be a large amount of money and you will get a very competitive interest rate on your investment. Much more than if you left it in a savings account in a bank! This information may not be relevant to you but I can guarantee that it will be for someone you know telling people you know could be just as beneficial as investing yourself. The banks have forced the economy to its knees over the last number of years and this type of financing bypasses the banks, making winners out of businesses and ordinary, hardworking people. This is such a brilliant concept and not just for O'Donohues Bakery, this kind of thing should replace the bank loan system altogether! It removes the middlemen and relies on people power supporting their own economy locally or nationally. The slogan ‘Keep the Dough in Town’ has never been more relevant!